Sometimes it’s frustration, sometimes anxiety, sometimes rebellion. But also, it can’t just be that, because there are plenty of times I am anxious or frustrated and DON’T binge. It feels that the other person who has taken control is another version of me. When she takes control she convinces me that she is the real me. She waits until I am weak and down on myself to come and take over. What happens during a binge? Mentally I am usually pretty checked out, numb. In a trance almost. Physically not much until the end when my stomach is uncomfortably full. But I guess there are times when my tongue has hurt from eating too much salt or too much sour food. Like Captain Crunch, it turns out, is so crunchy that if you eat 3 bowls of it you’ll feel like you took an electric sander to your tongue. It’s more of an urgent experience. It’s chaotic, frantic eating. Sometimes I would just eat foods that were around, but other times I would plan it out and go to the store to buy foods specifically with the plan to eat them all. I wouldn’t even taste the food. I would just be numbly eating. I would make the rounds to different stores and buy a ton of junk food. Or I would go to 2-3 fast food drive-thrus. I just couldn’t stop myself. I was miserably full, to the point of feeling sick. It’s a feeling of total helplessness, like some other person has taken control. When I binge like that I feel like a duck who is being forced fed just so they can make foie gras. It is eating to excess, beyond what people would consider normal over-eating, often very fast, and with a sense of being out of control. It was ALWAYS a secret activity. A binge for me pretty much wipes me out for the rest of the day. I feel extremely guilty and purge. I feel shame and frustration, anger. Mostly anger at myself for having done something so stupid. Sometimes I feel hopeless, like I will never get better, like I am permanently broken. I have a food fog. My brain is thick from the overload. These candid accounts have helped me be sensitive to the other side of the eating disorder coin. I only knew restriction and now I see the physical and emotional pain that comes with bingeing. I also have a better understanding of how overeating and a binge are vastly different. One is considered a part of “normal” eating while the other is utter misery and interchanging the two only marginalizes the suffering of those who binge. I hope that the words above will shed some light on binge eating disorder and provide an opportunity for empathy for people like me who needed a little insight. 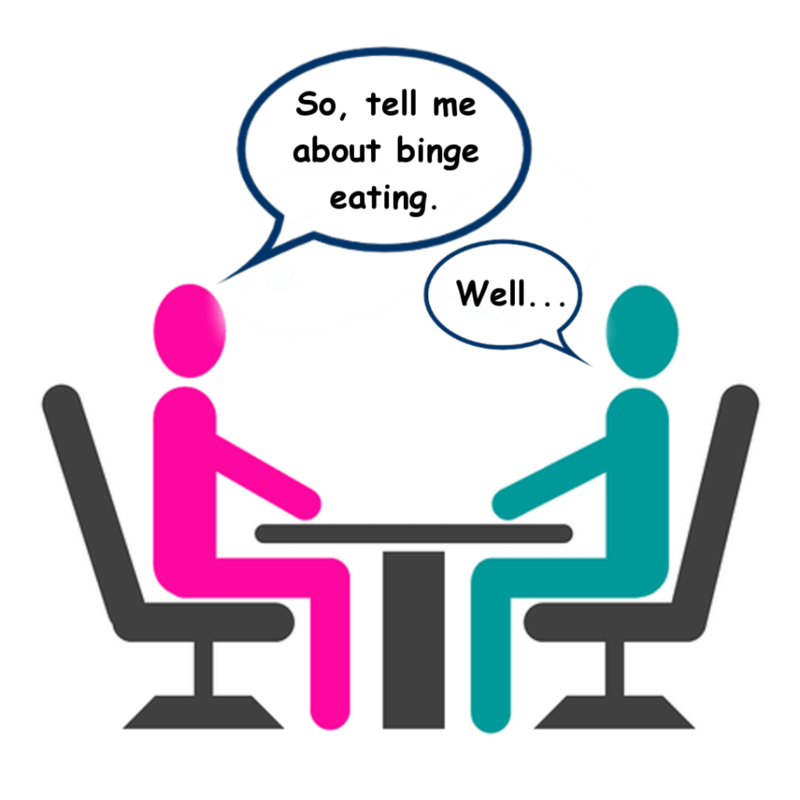 If you are someone who binges, what is your experience? If you feel comfortable, please share in the comment section below. 1This is sometimes referred to as a subjective binge. 2Thank you Facebook and the intuitive eating community forum members for sharing with me. I am most grateful. 3I consolidated people’s thoughts to offer a better picture of binge eating disorder. Even though their words may not be exact, the sentiment remains. I am a binge-eater and have been for as long as I can remember. It’s my biggest struggle with IE and I feel like I have tried everything possible & imaginable to not binge but for now I am concentrating on reducing the amount of food I eat and the frequency baby steps. I get SO frustrated when people loosely use the term – no it is NOT a binge if you ate 2 cookies and went over your MFP calories by 200 and it isn’t either if you had a second portion of pie. Like you said, “proper” binging is utter misery – it’s adrenaline, happiness, shame, anger, frustration, tears and acceptation all rolled into one horrific experience without any keys as to how to get out! You’re welcome and I’m so glad you could identify with this article! Thank you! Coming from a black and white personality IE is definitely a challenge. Thank you for your kind words!